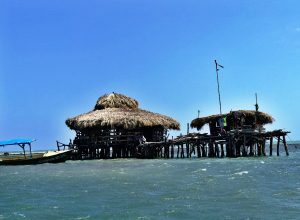 We were able to visit the Pelican Bar on Jamaica during our last visit to the island. If you haven’t been out there, go! It is seriously one of the coolest bars I have ever been to. The only way to get to Floyd’s Pelican Bar is by boat. Why? It’s a mile off-shore! Boats leave daily from Black River, Treasure Beach, and Parottee Point (where we launched from) and some resorts can also arrange transportation. We were staying at the Hyatt Zilara in Montego Bay and we drove for about an hour and 30 minutes to reach Parottee Point. 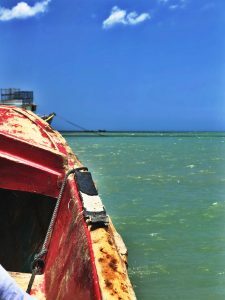 From there, it cost us $20 per person/round trip to be taken out to Floyd’s Pelican Bar. We just waited a few minutes for our boat to return from dropping other customers off and then we boarded our little boat. If you’re expecting great architecture, clean restrooms, and free WiFi, then this is not the place for you. This bar is built on stilts on a sandbar in the ocean. It has no restrooms or WiFi. The building is literally put together board by board and a little uneven in some places. What this place offers is charm, beauty, and a unique way to enjoy the Caribbean Breeze while enjoying a Red Stripe or Rum Punch. If you’re hungry, enjoy super-fresh lobster or fish that has been caught locally. Make sure you bring CASH because there are no credit card machines in the middle of nowhere. I recently purchased a GoPro Karma Drone and was excited to take it out to Floyd’s Pelican Bar. I managed to fly Karma around the bar, get some really nice shots and did not drown my drone! Landing the drone on about four feet of plywood was challenging and for this inexperienced Drone owner, I was pretty pleased with myself. And terrified. After I flew my drone, it was time to sit back and enjoy my surroundings. I brought a t-shirt that represents my daughter’s college and her sorority and asked for it to be hung on the wall. Here it is! Hotty Toddy, Y’all! A lovely breeze was blowing that day, so we sat in the shade, drank a rum punch (or three) and enjoyed our time there before a larger boat came along full of bar-goers. We took that as our cue to leave. The boat driver had given us his cell number, so we just gave him a call to let him know we were ready to go. He was actually already on his way out to the bar to drop off another group, so it was perfect timing! As I wrote before, the bar is built on a sandbar so water in the area can be waist deep to as little as ankle deep. If you plan to swim, you may want to wear swim shoes as there are all kinds of things on the ocean floor that could cut your feet. Bring Cash, as there is no other way to pay for your food or beverages. There is also a small area to buy souvenirs. If you want to leave your ‘mark’, bring a t-shirt, hat, etc. to be hung on the wall or ceiling. There is also a gentleman who will carve your name in the wood for $20. The bar has several types of beer to choose from, along with a few different ways to make a rum drink. They also have water bottles and soda. But when they run out, they run out. They just can’t hop down to the nearest market to stock up since it’s a mile offshore. So if they run out of what you’re drinking, just chill out and order something else. 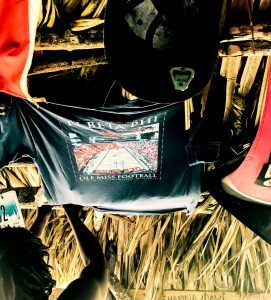 Visiting Floyd’s Pelican Bar takes “Island Time” to a whole new level. 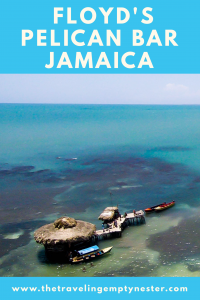 If you’re looking for a unique and interesting bar to visit during your time on Jamaica, consider adding Floyd’s to your itinerary. Last but not least, here is my drone footage from my visit. Enjoy! Such an interesting bar and looks really unique. Nice place. This looks beautiful and your pictures are amazing!